I am a potter. I intend my work to be used. I strive to address the subjects of presentation, utility, beauty, and craft in my work. Although I seek to make work that stands on its own, I feel that a piece is not truly complete until it is in use. The pot and its contents should exist symbiotically, each elevating the other to heighten the enjoyment of the meal. 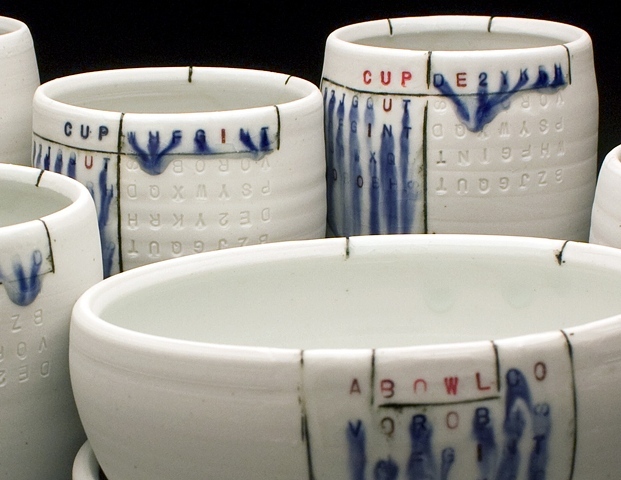 In my current body of work, I am decorating the pots with layers of text. The text is a decorative element, as well as a record of my communication with the object. The words that I record on the surface of the pot are those that I would like to say to the pot as it begins its life. I believe pots become alive though use, as they bear witness to the life of the user. The words I communicate to the pots give them their first breath of life, which I can only hope will be nourished by the next owner.